The essential part of the Scouting experience occurs through the Youth Program. 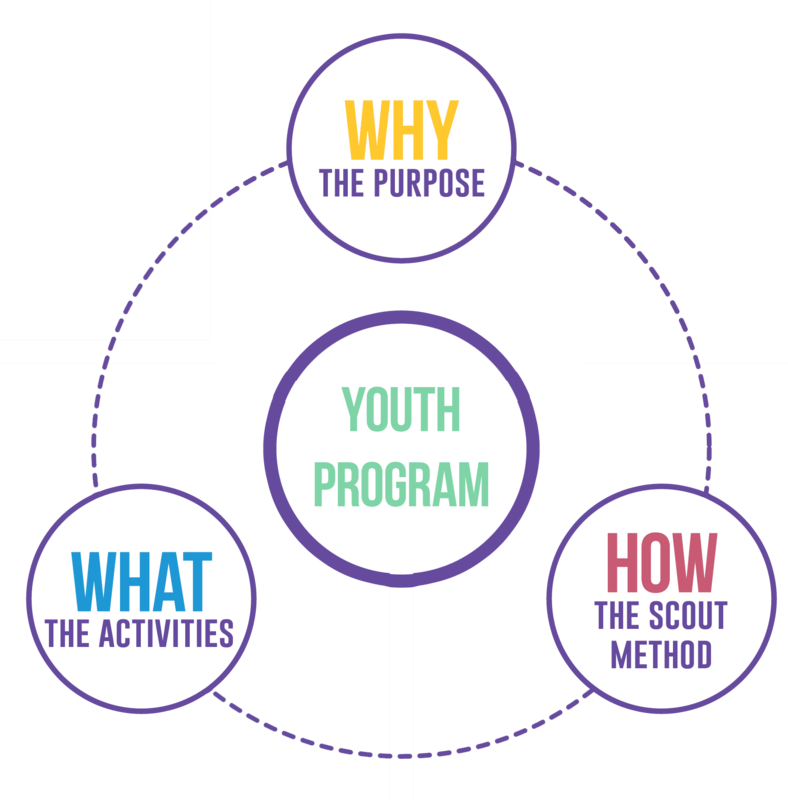 The Youth Program is defined by WOSM as the totality of what young people do in Scouting (the activities), how it is done (the Scout Method) and why it is done (the Purpose). The Youth Program occurs through a partnership between youth members and adult leaders, who take into account each young person’s interests, needs and abilities. The Youth Program in Scouting offers a progressive process of self education and personal development for children and young people. Activities are seen as the means rather than a goal, which create opportunities for each young person to develop skills and attitudes and to acquire knowledge. Young people are the main players in this non-formal educational process who require adequate adult support, usually provided by adult volunteers. Personal Progression is a learning journey that focuses on challenging the individual to do their best through a wide range of experiences. Sections must focus on ensuring that each individual is striving to reach their best possible goals, and the Section must support each individual during this process. This means the Section supports active exploration of each member’s commitment and responsibility to their community and the wider world. The Section is dedicated to being of service, and positive and visible members of the community. The Promise and Law are Scouting values that underpin all activities and interactions. They are integral for the continued success of the Section over time, and provide for bonding, camaraderie and self-reflection. Promise and Law help individuals understand their place in their community and the world. This means the Section is learning through practical experiences and activities on a regular basis. Scouting events, regular weekly nights and Patrol activities should not be a classroom, even though education is occurring. 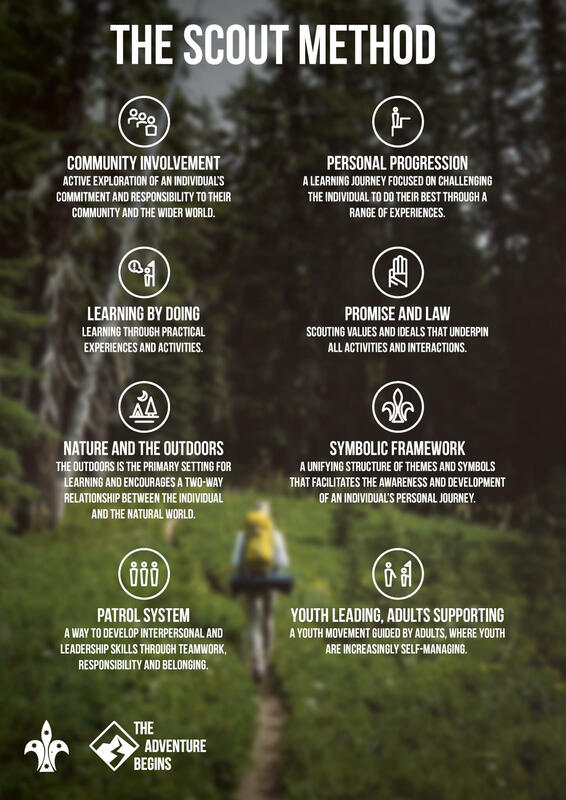 Scouting believes that the outdoors is the primary and most effective setting for learning and encourages a two-way relationship between the individual and the natural world. Each Section should spend a significant portion of their program outdoors, exposed to nature. The Symbolic Framework is a structure of themes and symbols that facilitate awareness and development during an individual’s personal journey. It is important that the Symbolic Framework is utilised for a Section to be coordinated with other Sections and aspects of Scouting. The Patrol System is integral to Scouting. It provides a way to develop interpersonal and leadership skills in young people, through teamwork, responsibility and belonging. Virtually all Scouting activities occur in Patrols, and it is incredibly important that Sections use this system to reach goals and overcome obstacles. ”Youth Leading, Adults Supporting” reinforces that Scouting is a youth movement, guided by adults. Youth Sections are increasingly self-managing. The Scout Method and ”Youth Leading, Adults Supporting” provide ample opportunities for youth members to develop as unique individuals as their strengths and weaknesses allow.